[Mac only] If you dread opening up TextEdit everytime you want to make a note and are looking for a note taking app that is unobstructive, responsive and multi-functional, Sidenote is the best choice for you. 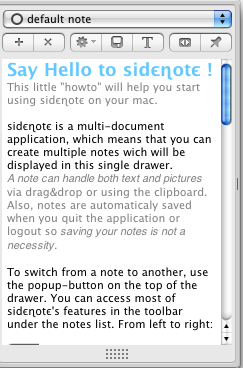 Sidenote is a note application that resides on the side of your desktop. It is a drawer app that hides itself when it is not needed and pops up when you hover your mouse over it. Sidenote uses the RTFD format which is the default text document format in Mac. This means that you can edit your font size, color, style and even add images and attachment to your text document. Sidenote supports drag-drop action, so next time you chance upon a good image or a paragraph of text that you want to save for future reference, you can easily highlight and drag the content to the Sidenote. When you first open Sidenote, it will automatically hide itself to the left side of the desktop. To display Sidenote, you can either shift your mouse cursor to the left, or press the hotkey Alt + Command + O. In fact, most of the actions in the Sidenote can be accessed by hotkeys and all the hotkeys can be configured in the Preferences. Although the whole app is only a small window at the side, it still comes with a well-designed navigational menu. At the top of the window is a dropdown bar where you can select your notes. Below it is the menu bar where there are icons for you to add new note, delete current note, save current note and change font style. Under the Preferences icon, you can also export, mail or print your note. Overall, Sidenote is a simple, yet handy app that you will fall in love instantly. It is available as a donationware and can be downloaded here. What other handy note taking apps do you use? A great Windows alternative is Office OneNote, which is included in Office 2007. The most useful feature is the screen clip tool (which a variant is also implemented in Vista), which allows you to capture parts of the screen by pressing Win + S.